In light of the increased use of wireless phones, cordless phones, and VoIP, Alpine Communications wants to remind you that these types of telephone technology may not work if electricity goes out during severe weather. One item to always have on hand is a corded landline phone that plugs into the phone jack in the wall. 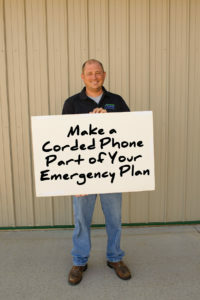 Since a corded phone does not require electricity, it can be your backup method of communication during and after a storm — keeping you connected to emergency personnel, family, and friends. Thunderstorms can cause electrical outages and your home electronics could be damaged due to circuit overload when power is restored. In addition, lightning strikes and unpredictable voltage changes may result in a surge of power to your home. The best way to protect your computers, TVs, cable modems, stereos, and other home entertainment equipment is to turn them all off and completely unplug them before the storm arrives. It only requires a few minutes to take these precautions, and they could save you money (not to mention headaches) once the storm has passed. For safety’s sake, we urge you to keep at least one corded landline phone in your home, along with a flashlight and other emergency items. Stop at the Alpine TEC store in Elkader for the latest in surge protectors, power conditioners, and corded telephones in case of a power outage.